The University of Wisconsin-Madison University Book Award is presented to a high school junior at the school's annual academic honors program. It is awarded to a junior who exhibits academic excellence, good character and the potential to succeed in college. The award itself is a book written by a UW-Madison faculty member or alumnus. We are excited to announce 2018-2019 as the inaugural year of the University of Wisconsin – Madison Book Award. The goal of the Book Award program is twofold: it combines the satisfaction of rewarding individual scholarship with promotion of the University of Wisconsin and the Wisconsin Idea among high school students. Each book award is sponsored by alumni, faculty/staff members or specific schools and departments of the University of Wisconsin-Madison. The book presented for the UW-Madison Junior Book Award is determined yearly. A committee chooses a recently published book by a University of Wisconsin Professor or Alumnus that reflects the criteria of the award. The book award is presented to an outstanding junior who exhibits academic excellence, extra-curricular involvement and the potential to do well in college. The University of Wisconsin Junior Book Award is distributed by University Book Store. We welcome expansion of the program through the sponsorship of the award by individual alumni, WAA Clubs, or by the secondary school itself. The cost of the award is determined yearly. How Not to be Wrong: The Power or Mathematical Thinking by Jordan S, Ellenberg, John D. MacArthur Professor of Mathematics and Vilas Distinguished Professor of Mathematics at UW-Madison. “The math we learn in school can seem like a dull set of rules, laid down by the ancients and not to be questioned. 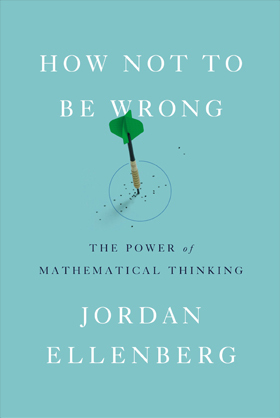 In How Not to Be Wrong, Jordan Ellenberg shows us how terribly limiting this view is: Math isn’t confined to abstract incidents that never occur in real life, but rather touches everything we do—the whole world is shot through with it. Sponsors choose the high school(s) where they would like a Book Award to be presented. The school will be notified and provided with criteria for selecting a student to receive the award and present the University of Wisconsin Junior Book Award at their annual awards ceremony. University Book Store will send each book award directly to the selected schools. The sponsor may choose the degree of participation, supplying the book to be presented by the school, attending the awards ceremony, or possibly presenting the book award at the ceremony. Only one award will be presented per school, so if your school of choice is already sponsored the Book Award Administrator will be happy to match you with another school in need. If you have any questions regarding the Junior Book Award program please contact the Administrator below. If your question is in regards to fulfillment or purchasing please contact the University Book Store.